Year after year, game after game, fans are lighting up more couches. "We wish that wasn't the norm anymore, but after a big victory again this weekend it kind of reared its ugly head," said Lt. Scott Wriggelsworth of the East Lansing Police Department. 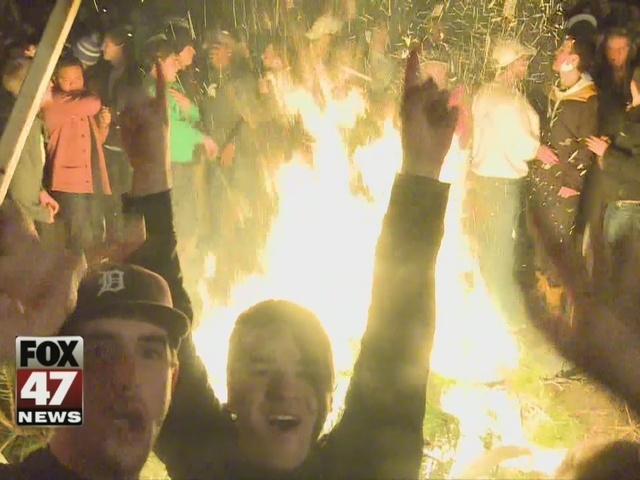 MSU students consider the couch burning a decades-old tradition. Junior Alex Catallo explained, "I don't see the issue. It's been that way for years. I know people who went here many many years ago, like 20 years ago and that's what they did." Sophomore Elaina Wargo added, "I think it's more just a funny joke; and, as long as no one's getting injured like that, then I don't see the harm in, you know, burning a couch or two." But, Lt. Wriggelsworth warns arson is a serious crime that could easily spin out of control. "The last thing we want to happen is someone severely burned or die because some idiot lit a couch on fire and a tragedy was caused by that," he said. "Not to mention, the police and fire responding to that scene, that's dangerous as well. So there's really no upside to it." MSU football team's success has ELPD and MSU Police already making plans for the Big Ten Championship in December. Lieutenant Wriggelsworth told FOX 47 that meetings started Monday morning. He explained, "We already have extra patrols that are gonna be on duty for that game, in anticipation of a lot of people in town and potential problems following that game. We hope that doesn't happen, but we have to be prepared for that." Because it seems no matter their effort, the out of control celebrations keep happening. So, Lt. Wrigglesworth said he's hoping publicizing the arrests will make a difference. "If you get convicted of or charged with arson, that'll stay with you for a lifetime. I mean who wants to hire an arsonist? I don't want to and I hope no one else does." That's why he asks fans to just not do it. ELPD says they've also had success catching people on social media. If photos or people are bragging about a fire, they can catch you in the act. Lt. Wriggelsworth said he's gone as far as dropping by students' houses the Friday before a game if they've joked about a fire on Twitter. The City offers a $500 reward for information leading to the arrest of anyone who sets a couch or anything else on fire.